← Museum Library – Used Book Sale, March 3-6! 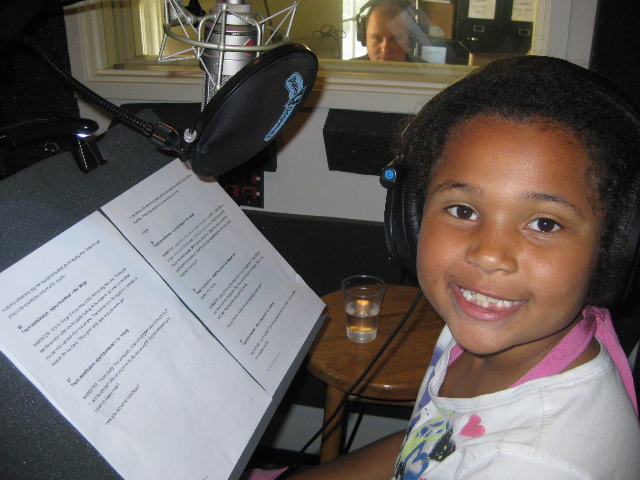 Meet Ayiana, Voice of our Family iPod Touch Tours! Ayiana, hard at work recording the "A is for Art" tour. Photo by Sandy Goldberg. Get ready: The Museum is launching its first iPod Touch Tour for families on March 12, 2011! It is currently in production. Here’s Ayiana Scott–she is 7 years old and one of our narrators for the A is for Art tour, designed especially for younger viewers. She’s the voice behind the tour. Make sure you stop by on March 12, when we also open the latest installation in the Kohl’s Art Generation Gallery–Just the WRIGHT Size: Designing and Building Small Houses. Don’t miss the chance to check out the Kohl’s Art Generation iPod Touch Tour and learn about art through games, videos and scavenger hunts all in the palm of your hand. This entry was posted in Behind the Scenes, Education and tagged Behind the Scenes, Kohl's Art Generation, Technology. Bookmark the permalink. 2 Responses to Meet Ayiana, Voice of our Family iPod Touch Tours!